Raford, Noah, et al. Alternatives to the Singularity. 2011, http://tiny.cc/ud2z0y. Hillen, Brittany. “Crypto-Art ‘Forever Rose’ Photo Sells for $1M, Making It the World’s Most Valuable Virtual Art.” DPReview, 19 Feb. 2018, available here. Catlow, Ruth, et al. Artists Re:thinking the Blockchain. Torque Editions & Furtherfield, 2017; Obrist, Hans-Ulrich. “Hello, Vitalik Buterin.” Tank Magazine, no. 74, 2018, http://tiny.cc/fb2z0y. Steyerl, Hito. Duty Free Art: Art in the Age of Planetary Civil War. Verso, 2017. Walter Robinson, Flipping and the Rise of Zombie Formalism, Link. Hertig, Alyssa. 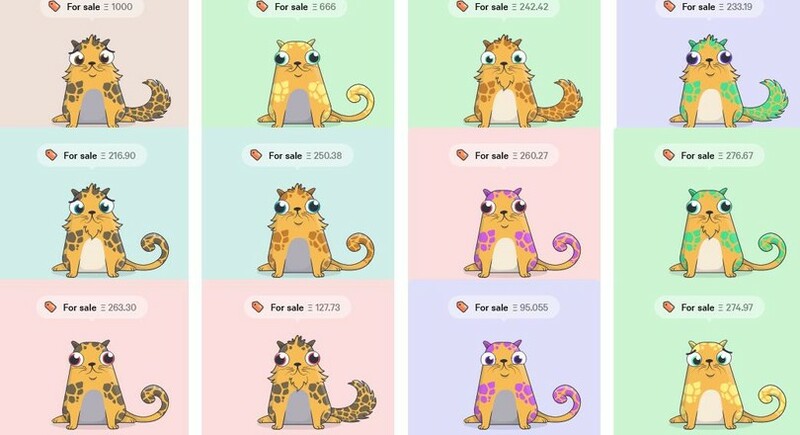 “Loveable Digital Kittens Are Clogging Ethereum’s Blockchain.” CoinDesk, 4 Dec. 2017, http://tiny.cc/051z0y. An issue that (Obrist) addresses in his interview with the founder of Ethereum, too. Faife, Corin. 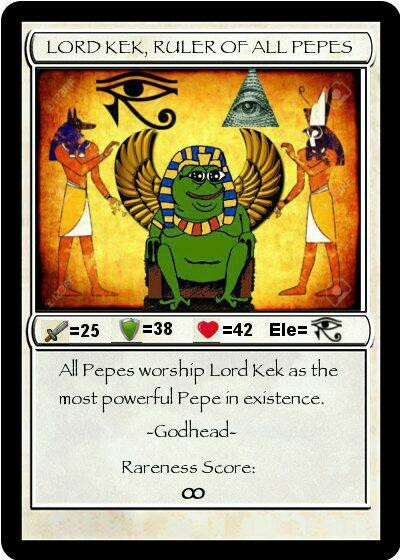 “Meme Collectors Are Using the Blockchain to Keep Rare Pepes Rare.” Motherboard, 27 Jan. 2017, http://tiny.cc/w31z0y. Osborne, Peter. Anywhere or Not at All: Philosophy of Contemporary Art. 1 edition, Verso, 2013, 37. Avanessian, Armen, and Suhail Malik. “The Time-Complex. Postcontemporary.” Berlin Biennale, 2016, http://tiny.cc/d11z0y; Gillick, Liam. “Contemporary Art Does Not Account for That Which Is Taking Place.” e-Flux Journal, vol. 21, Dec. 2010, http://tiny.cc/x41z0y. Osborne, Peter. Anywhere or Not at All: Philosophy of Contemporary Art, 27. Osborne, Peter. Anywhere or Not at All: Philosophy of Contemporary Art, 48. Adorno, Theodor W. Philosophie der neuen Musik. 7th ed., Suhrkamp Verlag, 1995, English as Philosophy of Modern Music. Reprint edition, Continuum, 2007. Osborne, Peter. Anywhere or Not at All: Philosophy of Contemporary Art, 211. Block, René, editor. 1962 Wiesbaden Fluxus 1982. Harlekin Art, 1982. Lippard, Lucy R. Six Years: Dematerialization of the Art Object. 1st edition, Studio Vista, 1973. Maciunas, George. “Manifesto II.” George Maciunas Foundation Inc., 24 Feb. 2010, http://tiny.cc/z91z0y. Heidenreich, Stefan. “Freeportism as Style and Ideology: Post-Internet and Speculative Realism, Part II.” e-Flux Journal, vol. 73, May 2016, Link. Hui, Yuk, and Andreas Broeckmann, editors. 30 Years after Les Immatériaux: Art, Science, and Theory. meson press eG, 2015. Initiated, among others, by Bert Papenfuß, Wolfgang Müller, Carsten and Olaf Nicolai. See Adema, Janneke, and Gary Hall. “Posthumanities: The Dark Side of ‘The Dark Side of the Digital.’” Journal of Electronic Publishing, vol. 19, no. 2, Fall 2016, doi: http://dx.doi.org/10.3998/3336451.0019.201. If one pushes aside technological details like 3D printing and Airbnb storage, then the Crapularity also describes collections of gallery and museum art that pile up in the spare rooms of the art system, i.e. the museum depots whose size continually grows in relation to exhibition space, and the tax-free airport storage facilities that private collectors use today. Withdrawal from public view is the necessary precondition for maintaining the fiction of scarcity upon which the conventional art market relies, without which its inflated prices could not be justified. In a general sense, the Crapularity is a form of accumulation of capital. Since this capital consists of “rubbish”, the Crapularity reenacts the subprime mortgage crisis and its financialization of default-risky credit and junk assets. In combination with newer digital technologies, contemporary art thus becomes “fintech”, that is, “financial technology” developed outside traditional banking and asset management arenas. From the article "‘Forever Rose’ Shares The Coding Love With Kids", available here. The combination of Blockchain technology hype and stock photography kitsch makes it easy to dismiss Forever Rose. On first sight, it is crapular material for future camp shows of late 2010s bad taste. 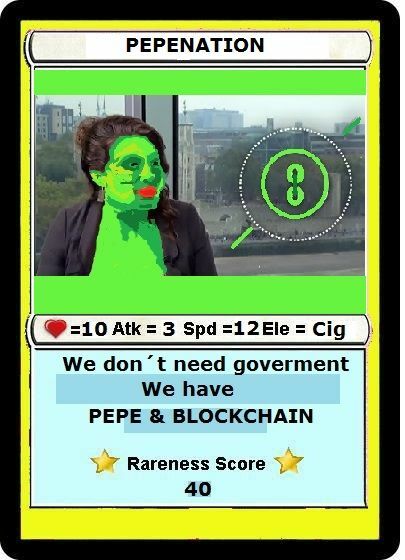 Aside from this specific (admittedly crappy) example, blockchain technology has become a subject of serious discussion in contemporary art, first through the efforts of London’s non-profit art organization Furtherfield and later by master curator Hans Ulrich Obrist via his interview with Ethereum blockchain founder Vitalik Buterin in the spring 2018 issue of TANK Magazine6. Forever Rose thus proves and even eclipses the “strange new future” that an article in the October 2017 issue of ArtReview had predicted, a future in which “art collectors and dealers will no longer worry about buying, selling, shipping and storing artworks. Instead, such works will all disappear into freeport vaults, while galleries and investors speculate on the rising value of a Jeff Koons or a Gerhard Richter, trading blockchain certificates with each other”.7 Forever Rose did not even need to be stored in a freeport vault, since it is a digital photograph that has not even been printed. Updated through fintech, the contemporary art market may finally catch up with contemporary capitalism: Buyers will be able to “short” an art work or artist, such as Jeff Koons and Liam Gillick, by betting on their future loss of value. The number of art buyers will greatly increase when ownership no longer entails possession of an entire artwork, but only of shares traded on stock markets. In this light, Forever Rose could be seen as the first example of an emerging subprime art market. There will be derivatives of these stocks, such as credit default swaps, as they already exist for cryptocurrencies. Until recently, the contemporary art market was based on the same economic principles from the 16th to 19th century, with oligarchs accumulating artworks as their private material possessions. Freeport art vaults are just the latest incarnation of this old-school market. Aside from their off-shore location, they do not differ much from the castles and mansions where aristocrats and the wealthy bourgeoisie locked away the artworks they had bought. Contemporary artist and filmmaker Hito Steyerl calls this “Duty-Free Art” in her homonymous book. She characterizes the underground airport depots where art is stored to evade taxation and be exclusively accessible to owners in zones of “permanent transit”: “They travel inside a network of tax-free zones and also inside the storage spaces themselves”, based on their change of ownership.8 This travel is best exemplified by Flip City, a series of forty digital paintings by contemporary artist Jonas Lund created in 2014 in the style of “process-based abstraction”, also known as “Zombie Formalism”,9 a short contemporary art hype of that year. Back then, collector Stefan Simchowitz became notorious as a “flipper”, a collector who quickly bought and sold – “flipped” – works of emerging artists he had discovered. 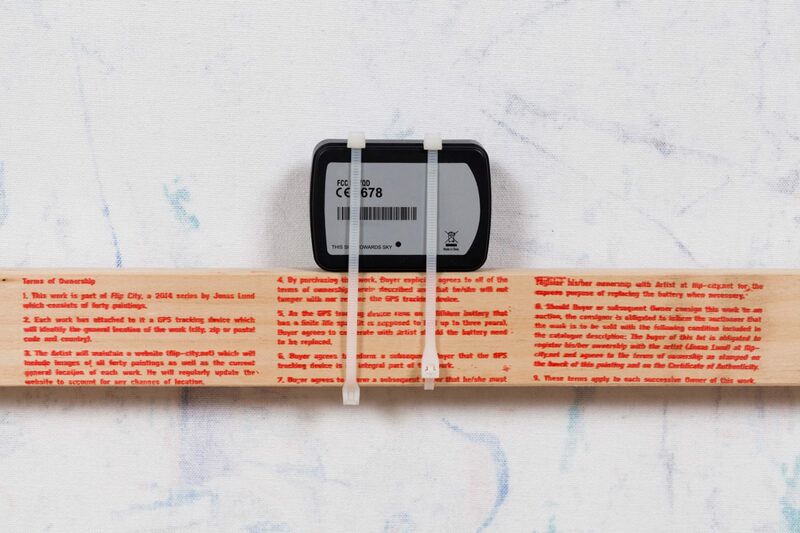 In Flip City, Lund not only digitally remixed existing Zombie Formalist works, but more importantly attached a GPS device to each painting in order to track its relocations in its process of being flipped. Each of the paintings and the changes of its locations are documented and tracked on Lund’s website flip-city.net. Jonas Lund, Flip City, 2014. Jonas Lund, Flip City (detail), 2014. 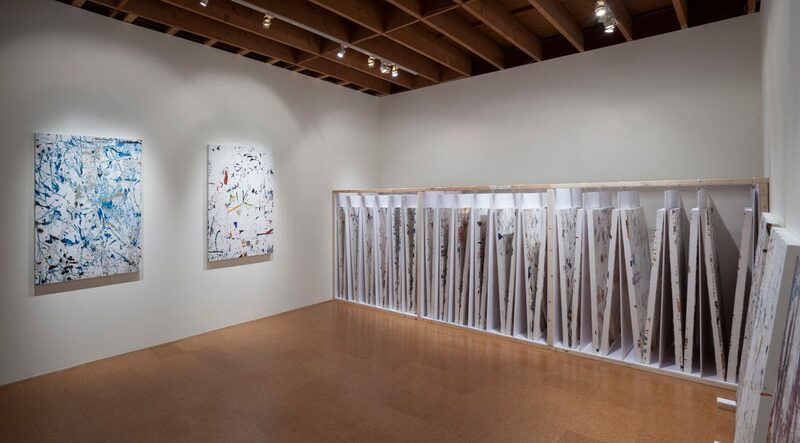 Jonas Lund, Flip City Installation View. All this could be called “contemporary art” in the most literal sense of art that not only depicts, but enacts contemporary culture in all its glory and misery. Yet doing so, it contradicts the arguably most widespread and influential definition of contemporary art within the contemporary art system itself. Its coiner (no blockchain pun intended), the philosopher Peter Osborne, defines contemporary art as “post-conceptual art”.14 In his definition, “contemporary” no longer is a generic attribute referring to all art that is currently being made, but it becomes a particular philosophical and historical concept, and contemporary art a period or even genre of art after modern art. The conspiracy of contemporary art (to echo Jean Baudrillard) is that (a) its curators and (b) the large audience actually mean two different things with the same words. Most people in “contemporary art” who understand the term as a generic description of art currently made are likely unaware of the actual benchmarks that curators and institutions use to qualify something as “contemporary art” in Osborne’s sense, i.e. as the “post-conceptual art” shown at biennials and in contemporary art centers. 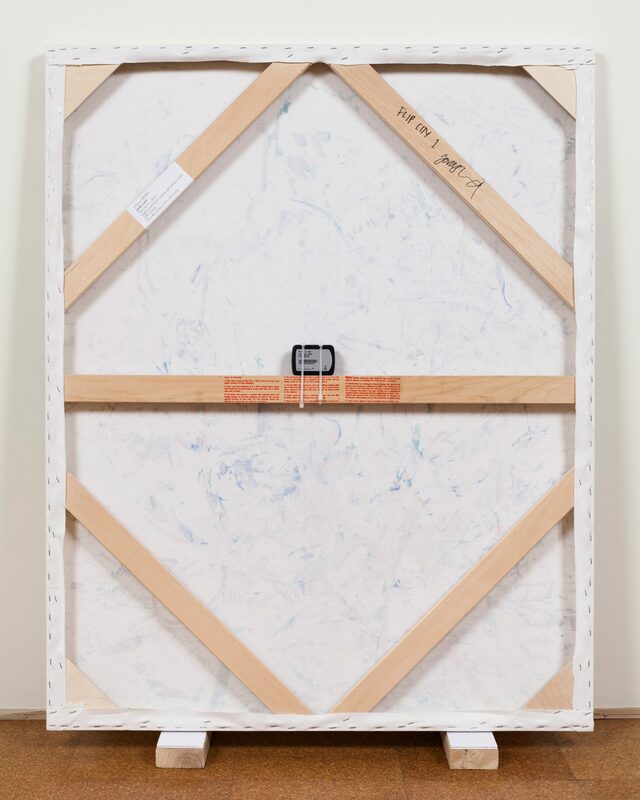 Art theorists like Suhail Malik and Armen Avanessian and artists like Liam Gillick now even talk about “postcontemporary” art.15 For Gillick, contemporary art “has become historical, a subject for academic work” and is identified with a period between “1973 and 2008”,16 in line with Osborne’s “post-conceptual” characterization. Osborne furthermore identifies contemporary art with a particular institutional framework: “the inter- and transnational characteristics of an art space have become the primary markers of its contemporaneity”.17 Contemporary art is, in other words, more defined by its institutional framework than by its practice. As a result, what the Institutional Critique from the Art Workers’ Coalition to Andrea Fraser had described as a shortcoming of the contemporary art system, now becomes its distinctive mark. Or, to use a computer-cultural phrase: the bug has become a feature. Osborne supplements this definition with six formal criteria for contemporary art, including “conceptuality” and an “aesthetic dimension”.18 They amount to a formula for the curation of Biennials and contemporary art spaces as well as for the insider knowledge to be taught in postgraduate art study programs that transform artists from naive B.A.-level practitioners to “contemporary artists”. Crapularity aesthetics thus concerns contemporary art that may or may not be in bed with critical theory, but for which commodification critique – as a critique of not just the subject matters, but also the ontology and economy of artworks – has been given up. In other words, it does not matter for the Crapularity of a (figurative) pig whether the lipstick of critical theory or institutional critique has been put on it or not. Neue Musik, while representing an older form of critical theory aesthetics, deserves credit for resisting commodification, where, for example, Brian Ferneyhough’s work has no commodity value to speak of, unlike that of Liam Gillick. 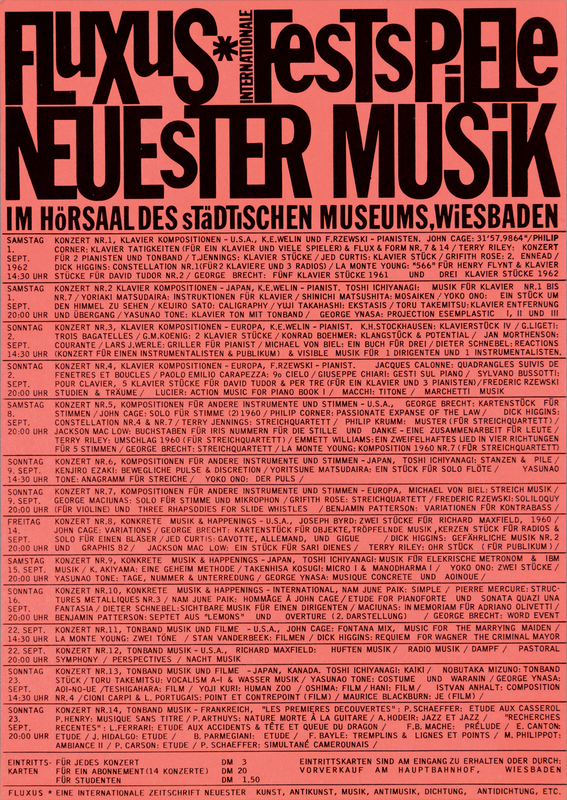 An interesting historical detail in this context is Fluxus and the fact that it nominally did not begin as an art movement, but in 1962 under the moniker of “Neueste Musik” (“Newest Music”).23 “Neue Musik” was thus the original reference for the early beginnings of a performative and conceptual art tradition that conversely became the point of reference for “contemporary art”. What Lucy Lippard called the “Dematerialization of the Art Object from 1966 to 1972” in the subtitle of her book Six Years24 thus began four years earlier and amounted to dematerialization only if one took visual art, not musical performance as its discursive framework. Retrospectively, Lippard’s term “dematerialization” is problematic from a materialist perspective – i.e., both from viewpoint of critical theory from Marx to Adorno and of fundamental ontology from Heidegger to Speculative Realism, since the practices described by Lippard and others did not change the material conditions of art as such. Rather than dematerializing art, they decommodified it, most radically in Fluxus where George Maciunas’ main occupation was to think up and try out “nonprofessional, nonparasitic, nonelite” art with communist business models for artist cooperatives.25 Even in the later, more mainstream practices of performance art, land art, artists’ books, video and new media art, art market commodification remained difficult, since its objects either do not fit depots or have less collector value because of their mass media reproducibility. From Fluxus to Art Basel (with its close neighborhood to the freeport depots of Zurich and Luxembourg) and meme blockchains coupled to speculative cryptocurrencies, the decommodification of art has been a hopelessly lost cause. Retrospectively, it looks like a failed Hegelian utopia, including the one of the “end of art” which Hegel had predicted in his aesthetic philosophy and which Maciunas tried to achieve in a populist manner by ending art through a “substitute art-amusement”.26 The Singularity is another such Hegelian redemption narrative whose reality of computer crashes, incompatibilities, quick digital obsolescence, permanent system updates, alt-right bots and other malware is more adequately described by the word ‘Crapularity’. If one draws a general conclusion from the specific example of freeportism, then the Crapularity can be broadly described as the evil little brother of object-oriented ontologies. It is an ontology of encroaching and accumulating objects and once-proclaimed “immaterials” (to use a term by Jean François Lyotard29) that return as zombies. 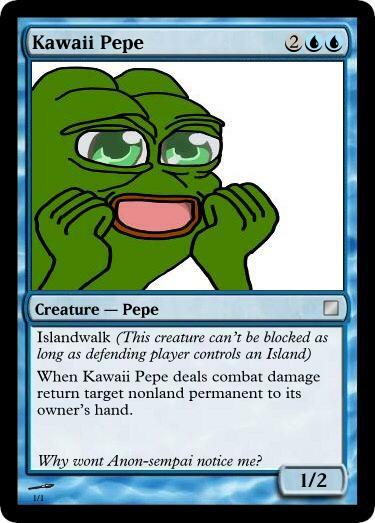 Its examples include conceptual art that ends up as “post-conceptual” art in freeports, the Internet mutating into a crapular “Internet of Things” (made up of throwaway and criminally insecure networked gadgets), Linux and Open Source ending up as cost-free software infrastructure for two billion crapular Android devices and two billion Facebook accounts. The crapularity now also includes the way utopian economic experiments – from the self-sustaining communities in the Arts and Crafts movement, Maciunas’ Fluxus projects to the experimental “Knochengeld” currency in 1993 East Berlin30 – return as the zombies of Bitcoins and Rare Pepes. The ramifications of the Crapularity are thus ethical, financial-technological, ecological, political and – as “Forever Rose” shows – aesthetic. All these shortcomings boil down to a conflict between a stated epistemology (or concepts, or metaphysics) and ontological conditions, respectively ecologies. The same conflict is present in the Singularity as a metaphysical concept versus the Crapularity as an ecological condition. While the Singularity remains an eschatological horizon, the Crapularity is the real-life social condition. 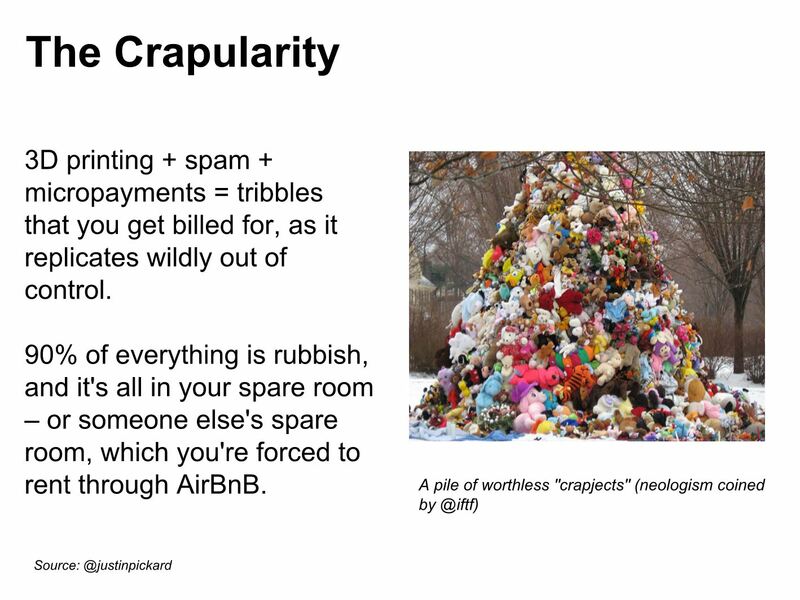 The Crapularity not only incorporates ethical, financial-technological, political and aesthetic conditions, but it also glues them together. Therefore, a contemporary art that lives up to its name can longer suffice with a critical theory position. In the Crapularity, there is no metaphysical position for “theory” as opposed to “practice”, no spectator’s seat (or white cube) for negative dialectics, and no escape from being implicated and incorporated. There is an arts history of working within crapularities. 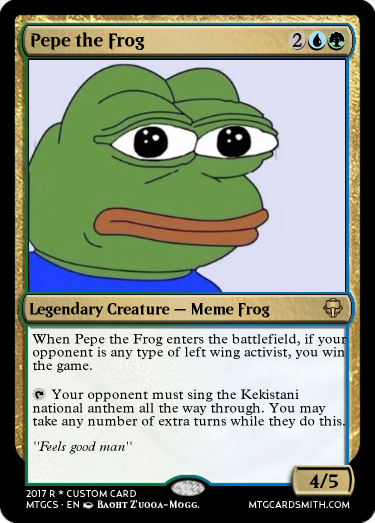 It runs at least from Fluxus to punk while its latest manifestation, meme culture, has gone down the road of reactionary nihilism. Crapularity aesthetics is thus in need of an update, through artists. 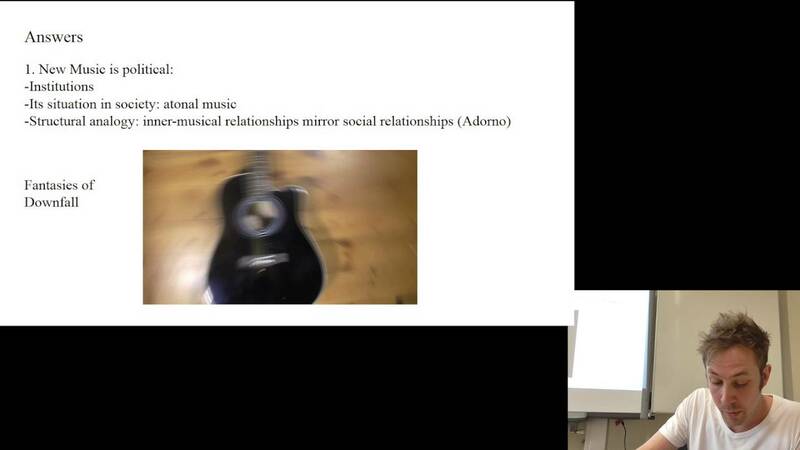 Florian Cramer (1969), reader in 21st Century Visual Culture/Autonomous Practices at Willem de Kooning Academy, Rotterdam, Netherlands.